This is a wonderfully versatile accompaniment to barbecues, picnics and sandwiches. Preheat the oven to 140°C/275°F/Gas Mark 1. Slice the tomatoes in half and place side up on a baking tray. Season with salt and pepper and drizzle with a little oil. 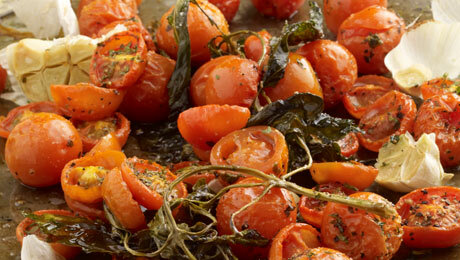 Sprinkle with garlic and herbs and place in the preheated oven for 1½ hours until the tomatoes have collapsed. Leave to cool in the oven with the door ajar. Next spoon the tomatoes into a sterilised jar, and cover completely with olive oil. Ensure there are no air pockets between the ingredients by stirring the mixture with a knife. Seal and refrigerate until required. Store in the fridge but remove at least half an hour before serving as the oil partially solidifies in the fridge.